California riders have known for a long time that lane splitting is legal in California. Many riders—especially moto commuters—cite lane sharing as one of the big reasons riding is awesome. But many folks have long seen lane splitting as a gray area. 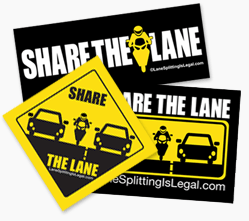 No more – the CHP has issued official lane splitting guidelines! Lane splitting in a safe and prudent manner is not illegal in the state of California. The term lane splitting, sometimes known as lane sharing, filtering or white-lining, refers to the process of a motorcyclist riding between lanes of stopped or slower moving traffic or moving between lanes to the front of traffic stopped at a traffic light. Motorcyclists who are competent enough riders to lane split, should follow these general guidelines if choosing to lane split. Travel at a speed that is no more than 10 MPH faster than other traffic – danger increases at higher speed differentials. It is not advisable to lane split when traffic flow is at 30 mph or faster – danger increases as overall speed increases. Typically, it is more desirable to split between the #1 and #2 lanes than between other lanes. Consider the total environment in which you are splitting, including the width of the lanes, size of surrounding vehicles, as well as roadway, weather, and lighting conditions. The guidelines are similar to those adopted by many moto commuters. Check out the full California lane splitting guidelines (note: this link has been updated by the CHP to a “Motorcycle Safety Information Update” since the guidelines were taken down). These are CHP GUIDELINES only, not state LAW or California Vehicle Code. 13 Pings/Trackbacks for "Finally! California Highway Patrol Issues Lane Splitting Guidelines"